Interested in the representation of women and men in the criminal justice system, whether as victims, offenders or practitioners? The Ministry of Justice has published the latest edition of its biannual report on “Statistics on Women and the Criminal Justice System”. The figures should be considered in the context of the most recent mid-year population estimates for 2011 quoted in the report, which show that of the total of 49,509,747 population of England and Wales who are aged over 10 years, women comprised 51% of the population, while men accounted for 49%. It may not come as a surprise that the figures confirm that there are significantly fewer women than men both subject to supervision in the community and also locked up in prison. More women, too, serve shorter sentences than men. Some of the key findings in the report are summarised below. There were differences evident in the level and types of victimisation between women and men. According to the 2011/12 Crime Survey for England and Wales (CSEW) – previously known as the British Crime Survey – 3 in every 100 adults were a victim of violent crime that year. A smaller proportion of women than men interviewed reported being victims of violence (2% women and 4% men). Women who reported being a victim of violence were most likely to be victimised by someone with whom they were already acquainted. For men, it was more common to be on the receiving end of violence perpetrated by a stranger. A greater percentage of women (some 7%) interviewed for the CSEW reported being victims of intimate violence (partner or family non-physical abuse, threats, force, sexual assault or stalking) than men (at 5%). Fewer women (201) than men (435) were murdered in 2010/11. With regard to murder, a greater percentage of female victims than male victims knew the principal suspect (78% of women victims of murder as opposed to 57%of male victims of murder). 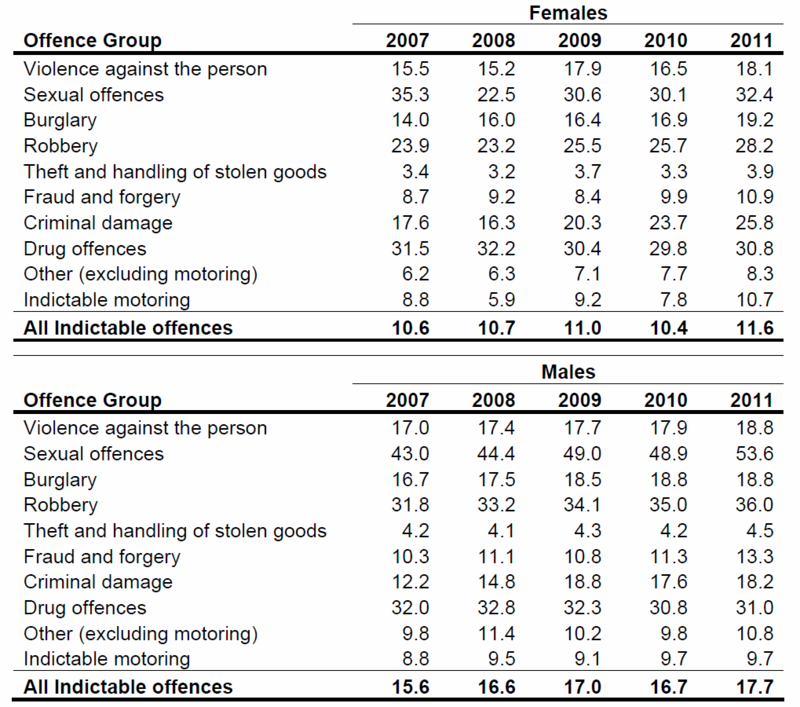 Theft and handling stolen goods (which includes shoplifting) was the most common indictable offence group for which both women and men were sentenced at all courts between 2007 and 2011 (this applied over half of all women sentenced (52%) but only a third of all men sentenced (33%) for indictable offences in 2011). Overall, a higher percentage of men(10%) than women(3%) were sentenced to immediate custody in 2011. Women also were more likely than men to be fined (77% of women as opposed to 61% of men). Men also received longer sentences. The average custodial sentence length for all indictable offences was consistently higher for men than women. This applied throughout the period 2007-2011. In 2011 in particular, the average custodial sentence length for indictable offences was 17.7 months for men compared to 11.6 months for women. The only indictable offence group for which females consistently received a higher average custodial sentence length than males between 2007 and 2011 was criminal damage (in 2011, 25.8 months for women as opposed to 18.2 months for men). The percentage of both women and men sentenced to an immediate custodial sentence rises with the number of previous cautions or convictions. In 2011, 39% of men and 29% of women with 15 or more cautions or convictions were sentenced to immediate imprisonment. A greater percentage of women in custody who had received an immediate custodial sentence were serving shorter sentences (12 months or less): 21% of women as opposed to 10% of men in 2011. For women serving prison sentences of 6 months or less, accounted for 15% as opposed to 7% for men. In 2011, there were fewer women than men under supervision in the community. A total of 19,018 women and 106,916 men were subject to supervision as a result of a community order or Suspended Sentence Order (these are the two most common types of community sentence). Women comprised 15% of those under supervision in the community as a result of community and Suspended Sentence Orders. The average length of community and Suspended Sentence Orders was shorter for women in 2011. In addition, women who started such supervision were commonly subject to fewer requirements to comply with than their male counterparts. In terms of order length, 14% of women supervised under a community order were supervised for less than one year. 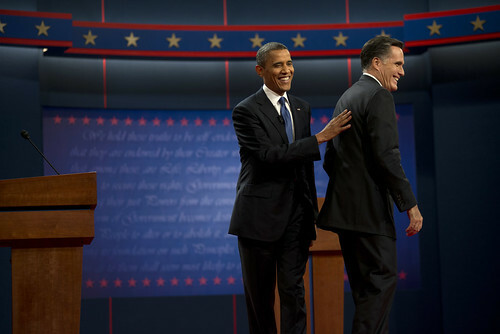 For their male counterparts, the corresponding figure was 7%. Both women and men supervised on community orders and Suspended Sentence Orders in 2011 had different age profiles. A greater percentage of women commencing community orders (55%) and Suspended Sentence Orders (58%) were aged 30+years when compared with their male counterparts (48% for both community orders and Suspended Sentence Orders). In 2011, a greater percentage of women completed both community orders (70% for women as opposed to 65% for men). This also applied to Suspended Sentence Orders. On November 23, 2012, there were 4,174 women in prison in England and Wales. The number of women prisoners increased during the decade ending in 2010 by around 27%. On 30 June 2011, women represented 5% of the total prison population of 85,374 inmates. According to the Prison Reform Trust, over half (51%) of women leaving prison are reconvicted within one year. For those serving shorter sentences (less than 12 months) this rises to 62%. In 2011, there were 24,648 incidents of self-harm in prisons. The rate for female self-harm in prison continues to register more than 10 times higher than the rate for men. In addition, women who self-harmed in 2011 did so more often than men (an average of 7.1 incidents compared to 2.8 incidents for each individual self- harming), though incidents of male self harm were more likely to result in hospitalisation. There are 630 women prisoners in England and Wales who are foreign nationals. They represent approximately 15% of the women’s prison population. On 30 June 2011, a larger percentage of foreign national women prisoners were incarcerated for drugs offences (39%) and fraud and forgery (14%) than British national women (18% and 3% respectively). British national women prisoners wee more often incarcerated for offences of violence against the person (29%) or robbery (10%) than foreign national women prisoners (for whom the respective figures are 13% and 3%). Of the the total of 329 self-inflicted deaths in prison in England and Wales between 2007 and 2011, the vast majority (95%) were men and five per cent (or 15) involved women). This, however, mirrors the gender representation in the prison population. In 2011, women prisoners were more likely to be subject to the disciplinary process than men. The rate of offences punished in prison establishments was higher for females (130 offences were punished per 100 female prisoners)than for males (with 106 offences punished per 100 male prisoners. 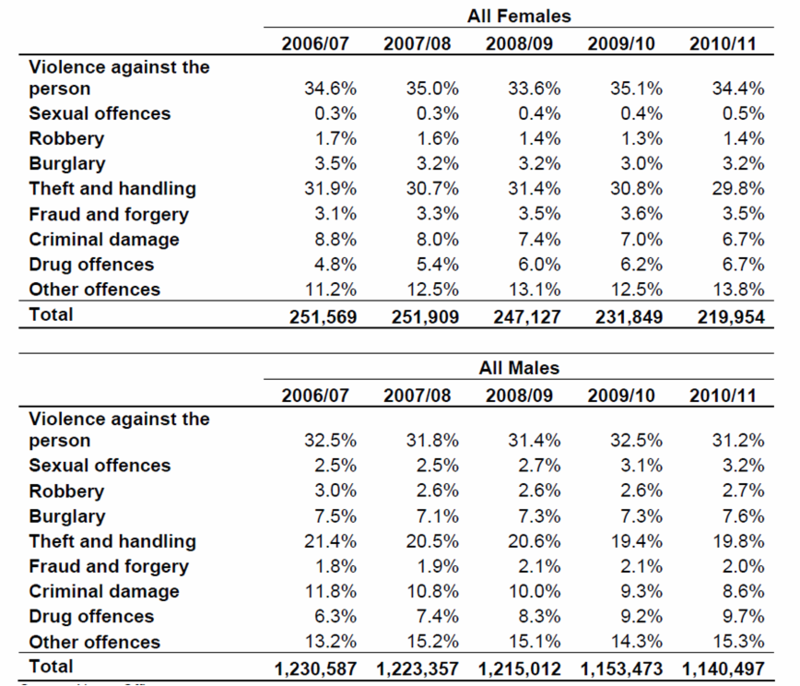 MINISTRY OF JUSTICE (2012), Statistics on Women and the Criminal Justice System 2011 London: Ministry of Justice. America locks up over two and a quarter million of its citizens – a greater proportion than any other country. What is less well known is that almost five million people are also subject to probation and parole supervision. America leads the world in imprisonment. The nation’s 5,000 plus jails and prisons incarcerate over two and a quarter million people. It remains a paradox that the planet’s richest nation, the ‘land of the free’, locks up a quarter of all the prisoners on planet earth. This means that one in every 100 adult American citizens is behind bars. These statistics, which reflect America’s umbilical attachment to incarceration, are well known to criminologists the world over, yet they still maintain their capacity to shock. The USA’s imprisonment rate is up to 10 times greater than that of most developed, industrialised countries. mandatory minimum sentences, which leave no room for judicial discretion in imposing lengthy prison sentences. At the end of 2010, the prison population very slightly declined (by 0.6 percent). This however, was the first fall in the total population behind bars in nearly four decades, and a decline in prisoners has yet to establish itself. American remains the incarceration nation. While academic attention has long focused upon America as the global leader for incarceration, less criminological notice has been taken of the widespread use of probation intervention. Almost 4.9 million people were supervised in the community on probation or parole at the end of 2010. This staggeringly high figure is is the equivalent of probation supervision for 1 in every 48 US adult citizens. It also helps explain why America employs over 93,000 probation officers and correctional treatment specialists. Though probation was traditionally regarded as most appropriate for low-risk offenders in the USA, probation staff have begin to supervise offenders who pose a higher risk, both of reoffending and to public protection. The maximum duration of a period of probation supervision is five years. Officers with caseloads of 200-300 clients are no longer unusual, which clearly limits the work that may be done to address the mix of complex issues which many contribute to reoffending. The average person on probation may have no more that 15 minutes contact time with their supervisor. This reflects penal priorities in the USA; over nine tenths of the correctional budget is spent on imprisonment, despite the fact about around 7 in every 10 offenders are in the community. People on probation (4,055,514 in total) account for the majority (83%) of all of those subject to community supervision. Parolees (840,676 in total) accounted for a smaller share (17%) of those on supervision. As with the prison population, the number of people on community supervision population is now beginning to very slightly decrease. The number of people on probation fell slightly, though the number of parolees increased. People who breached the conditions of their probation during 2010 were incarcerated at rate of 5.7%. About threequarters of people on probation were male, and a quarter were female. Over half of the probation population was white, while 30% was black and 13% was Hispanic. Both black people and Hispanic people are disproportionately represented in the probation population (just as they are in the prison system). Around three quarters of people on probation and four fifths of parolees are on ‘active probation’. The means that they must report in person on a regular basis to a probation or parole authority in person (or sometimes by telephone or email). Property offenders make up 28% of those on probation, while drug offenders comprise over a quarter of probationers. Just under a fifth of people on probation are supervised for a violent offence. One area in US probation would be unrecognisable to UK probation practitioners: the collection of ‘user fees’. Charging the user for the privilege of being supervised is growing in popularity in America. Some American probation services users have to pay a supervision fee of up to $100 per month. This is not new; Michigan was charging fees to users as early as 1929, and more than half of all US states were collecting fees by 1990. In the state of Texas in 1990, probation supervision fees charged to probation service users raised a total of $57 million, which was more than half of the entire supervision budget. Probation service users who are already coping with a range of problematic social issues in their lives, finding $100 to pay for their next probation appointment is often not prioritised. Failure to pay can mean a return to court, and then incarceration. The imperative to collect fees may also impact on probation staff’s capacity to support rehabilitation. Many American probation officers now carry guns. While firearms are not universally used, most US states have provision for armed officers. Within the federal justice system, too, most districts allow federal probation officers to carry guns. The harsh economic climate has hit US probation hard. Some 31 states made cut their corrections budgets in 2010. This has hit programmes geared at changing offenders’ behaviour hard. Nevertheless, probation still enjoys substantial political and popular support. It remains the preferred sentencing option in the US criminal justice system.